All performers hope to make a distinctive mark in their own time. The very best leave a legacy that endures long after they’re gone. A multi-talented entertainer who died 27 years ago has left us that, and more. Here’s Michelle Miller. 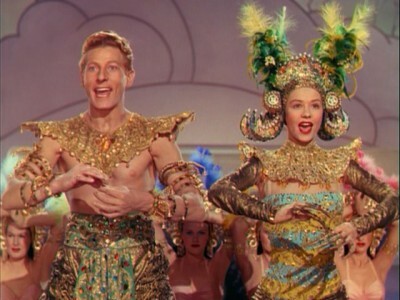 Back in Hollywood’s Golden Age, Danny Kaye was golden, and then some. He was an actor, singer, dancer, comedian . . . and, perhaps most important, a friend of children around the world. And to Dena Kaye, he was Dad. “If there was a story of unconditional love and wanting what was best for me, he was it,” she said. The only child of Danny Kaye and musician Sylvia Fine, she is now keeping her parents’ memory alive. Not long ago, she helped mount a special exhibit honoring her parents at the Library of Congress in Washington. It’s now in Los Angeles. David Daniel Kaminsky grew up in Brooklyn, the son of Ukrainian Jewish immigrants. He was a high school dropout who spent summers performing in the Catskills. Kaminsky became “Kaye” — and a legend was born. “He did it very, very, very, very fast, and it stopped the show,” said Dena. Soon, Hollywood took notice. 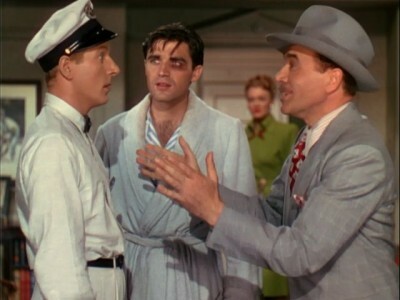 Kaye starred in more than two dozen movies — classics like “White Christmas,” and in “Hans Christian Andersen,” one of his most beloved roles, Kaye portrayed the prolific Danish storyteller. His wife Sylvia wrote many of his songs. “She used to say, ‘I had radar for Danny and I could tell what he was going to be able to do before he knew it,'” said Dena. Shortly after Dena was born, there were rumors of Kaye’s affairs with other women . . . and other men, the most infamous (allegedly), Sir Laurence Olivier. “What do you say to that?” asked Miller. I’ve been a Danny Kaye fan since I stumbled across The Court Jester on a UHF channel one afternoon when I was very young back in the 1970’s. His films will never be confused with high art, but the nonsense song, wacky slapstick, and his likable personality make them a wonderful way to pass the afternoon. While his biggest films have been available on DVD (and some have been released on Blu-ray) his earliest films haven’t been available… until now. Warner Archives have released a great collection of Kaye’s earliest feature films in the four-disc set, Danny Kaye: The Golden Years. Comprising four of his first five films (the one omitted is the popular Secret Life of Walter Mitty, the remake of which is going to be released on Christmas Day, 2013) and these show what a talent he was from the beginning. Without a dud in the bunch, fans of the comic will want to make sure they snag a copy. 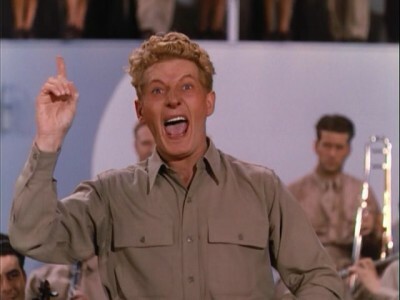 Up in Arms (1944): After appearing in a few low-budget two-reelers in the late 1930’s, Danny Kaye appeared on Broadway and was greeted by so much acclaim that Samuel Goldwyn gave him the staring role in the Technicolor production of Up in Arms, a remake of 1930’s Whoopee! (originally string Eddie Cantor). Danny Weems (Danny Kaye) is an extreme hypochondriac who works as an elevator operator in a building that houses several doctors’ offices (that way he can describe his symptoms to the physicians as they’re going to and from work). He’s sure he won’t be called up for military service, after all he’s terribly sick, but the draft board doesn’t see it that way. He’s gets his notice and heads off to war along with his best friend Joe (Dana Andrews). There is a complication in Danny’s life, aside from his imagined illnesses: He’s in love with a nurse from his building, Mary (Constance Dowling), who only has eyes for Joe. Meanwhile another nurse, poor Virginia (Dinah Shore) does love Danny, but he’s too thick-headed to see it. When the go off to was the women sign on too and all four end up on the same troop transport ship where Danny tries to confess his love to Mary while Virginia tries to corner Danny and they all try to avoid getting caught. Kaye really hit the ground running with his first feature. The beginning where everyone is in New York is a little slow in places, but once everyone joins the Army it’s a very entertaining flick. 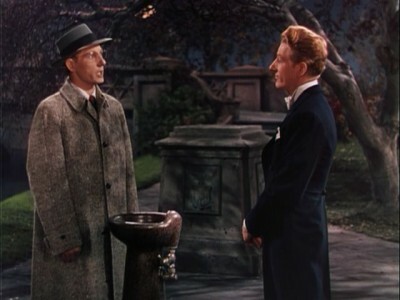 Danny Kaye uses a lot of the devices that he’d become famous for in this film: there’s a song filled with nonsense lyrics (which is hilarious), he impersonates an immigrant in order to get out of a jam, and there’s a lot of goofy banter. The movie was quite a success when it was released and made Danny Kaye a star over night. 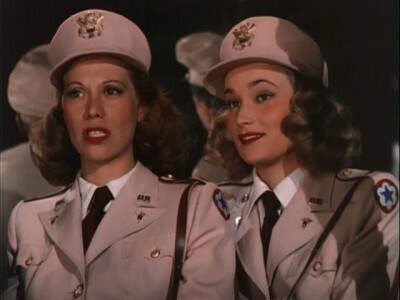 The Wonder Man (1945): For the follow-up film, Kaye is partnered with Virginia Mayo for the first time. She appears opposite him in the other movies in this set too. Buzzy Bellew (Danny Kaye) is a dynamic, outgoing star of the stage who is much more concerned with getting a laugh than being on time. He’s a stand-up guy though, so when he sees a murder, he agrees to testify against the mobster who committed the crime, “Ten Grand” Jackson. Ten Grand has other plans however. One evening before Buzzy is about to go on, a delivery man enters Bellew’s dressing room with some flowers and shoots him. Buzzy is then passed out a window to a waiting van and his body is dumped into the river. He’s dead and gone. Well, dead… but not quite gone. It turns out that Buzzy has a “super-identical” brother. Though long estranged, Buzzy is able to contact his sibling Edwin and draw him to the place where his body was dumped. There Edwin discovers that not only can he see and hear Buzzy (and he’s the only one who can), but his brother can also take over his body for a short amount of time. Buzzy needs Edwin to testify in his place and put Ten Grand behind bars, but the gangster has no problem with killing the witness a second time. This was my favorite film in the set… it’s hysterical. Kaye does a great job playing ‘a man inhabited by the spirit of another’ and there’s more than a little bit of squirming that the audience will do when Edwin gets on stage and Buzzy fails to take him over. Add to that some really awkward situations where Buzzy’s girl and you’ve got a classic film. It deserves to be better known. The Kid From Brooklyn (1946): This film is a remake of a Harold Lloyd film, The Milky Way (1936). While I love the original, the Danny Kaye version is very good too. Kaye plays a quite, unassuming milkman, Burleigh Sullivan, who happens to be good at ducking punches. When he gets into a scuffle with a drunken middleweight champ, Speed McFarlane, the boxer ends up knocked out and the press have a field day. When Burleigh goes to apologize and the champ ends up on the floor again, this time when the press can get a photo, the milkman ends up being the talk of the town, and Speed’s manager takes on Sullivan and turns him into a fighter… or does he. This is another nice film that has a lot of wholesome laughs. Virginia Mayo plays Kaye’s love interest again, this time as an out of work singer that Sullivan falls for. The two have a good amount of chemistry on screen and she’s quite good opposite Kaye. Some of the boxing scenes are great, but the best part of this movie is the nonsense song that the star sings. It’s wonderfully inane. 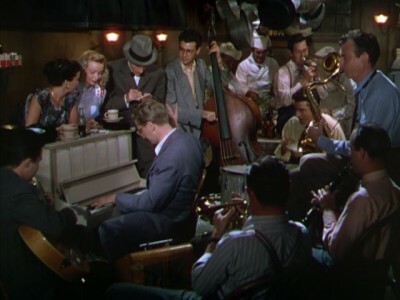 A Song is Born (1948): After finishing The Secret Life of Walter Mitty (not included in this set), Danny Kaye started in this picture, a remake of Balls of Fire (1941) that originally stared Gary Cooper. In the original, Cooper was part of a group of professors who were writing a definitive dictionary and needed to learn the newest slang terms. For this picture they changed it just slightly: Danny Kaye plays a scholar, Professor Hobart Frisbee, who is working on a music encyclopedia. 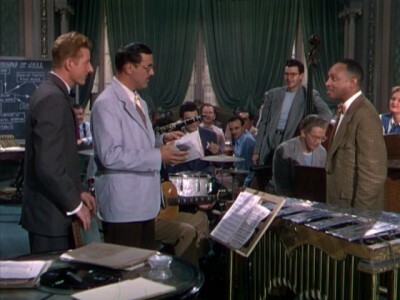 When he and his partners (one of whom is played by Benny Goodman) hear that there are new types of music called “Jazz” they decide to educate themselves on the style. At a jazz club they encounter a singer named Honey Swanson (Virginia Mayo), who needs to make herself scarce so the police won’t make her testify against her mobster boyfriend. She ingratiates herself with the music professors and pretends to fall in love with Frisbee so that she can stay with them and eventually con them into transporting both her and her thug boyfriend across the state line. Danny Kaye was going through a rough time while this film was being made. Though he was at the top of his career after his smash hit Walter Mitty, he was having personal problems. He was separating from his wife, who was also his song writer, and it was troubling him greatly. Though he’s still very good in this movie, he’s not quite as energetic and doesn’t have that spark of fun that fills the other movies in this set. Aside from that, the film works wonderfully. Jazz fans will want to check this out just for the music and great musicians who fill the film. In addition to Benny Goodman, Tommy Dorsey, Louis Armstrong, Charlie Barnet, and Mel Powell all appear. The music is naturally great and there are plenty of laughs. These four films arrive on four pressed DVDs (presumably only the first printing will be pressed and subsequent runs will be DVD-Rs) housed in a single-width quadcase. The mono audio is pretty decent across the four titles. There isn’t any hiss or other background noise that’s noticeable at normal viewing levels and the songs come across loud and clear. Of course the films are hampered by the technology of the time, but these films still sound pretty good. The unrestored image looks very good on these movies. Filmed in beautiful Technicolor, the 1.33: 1 aspect ratio has been preserved for all of the films and the colors are bold and vivid. The level of detail is very nice and thought there are a couple of rare specks on the prints, damage is very minimal. Fans will be very pleased. The set includes trailers for the four films, but no other bonus items. What a wonderful set. 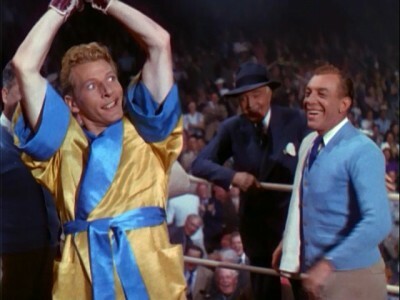 If you only know Danny Kaye through his bigger films, do yourself a favor and check these out. There’s not a dud in the bunch and they’re all funny, enjoyable and entertaining. Highly Recommended. The Warner Archive Podcast welcomes Dena Kaye for a wonderful look back at the work of her father, Danny Kaye. Danny Kaye: The Goldwyn Years is available at WarnerArchive.com. All Podcasts also available on iTunes.